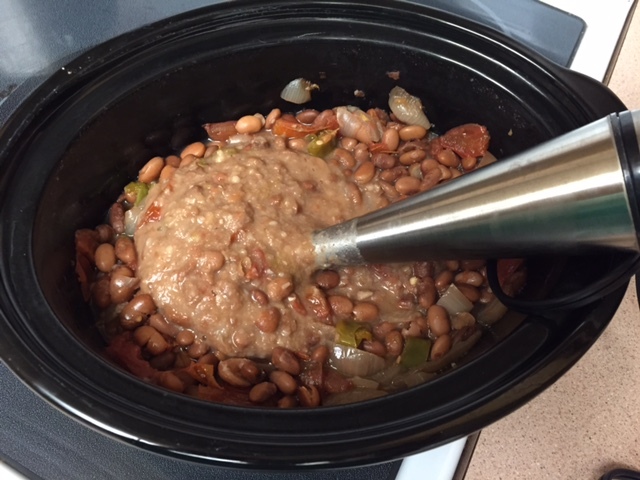 You’ll never want to buy a can of beans again after tasting these and seeing how easy and cheap they are to make. 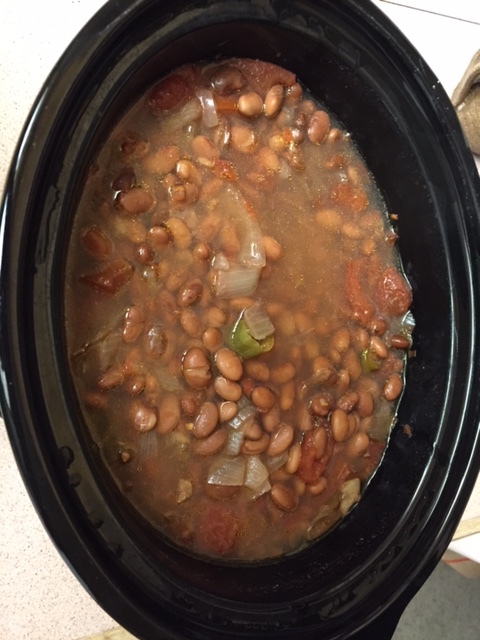 Beans, beans, the musical fruit… the more you eat the more you toot… the more you toot the better you are… so eat some beans and toot some more. On a more serious note (no pun intended) beans are one of my favorite comfort foods. They are easy on the budget, taste delicious, and are very good for you. This time of year they are particularly delicious because of all the fresh produce that’s available. 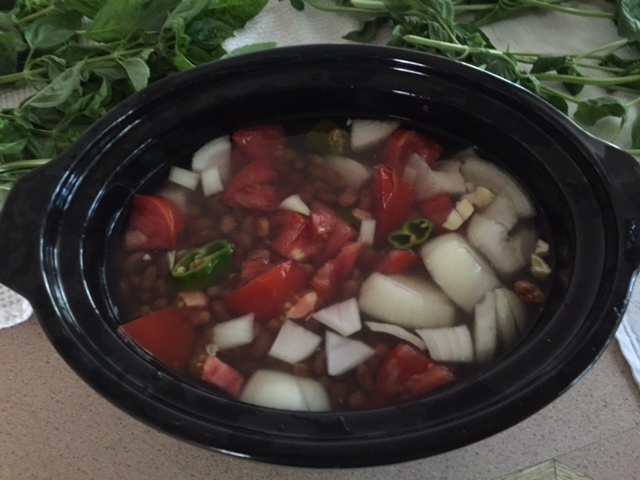 Ingredients: 2 cups dry pinto beans (rinsed), 2 tomatoes, 1 onion, 1 green chile or jalapeño, fresh garlic clove, salt, 2 splashes of olive oil. 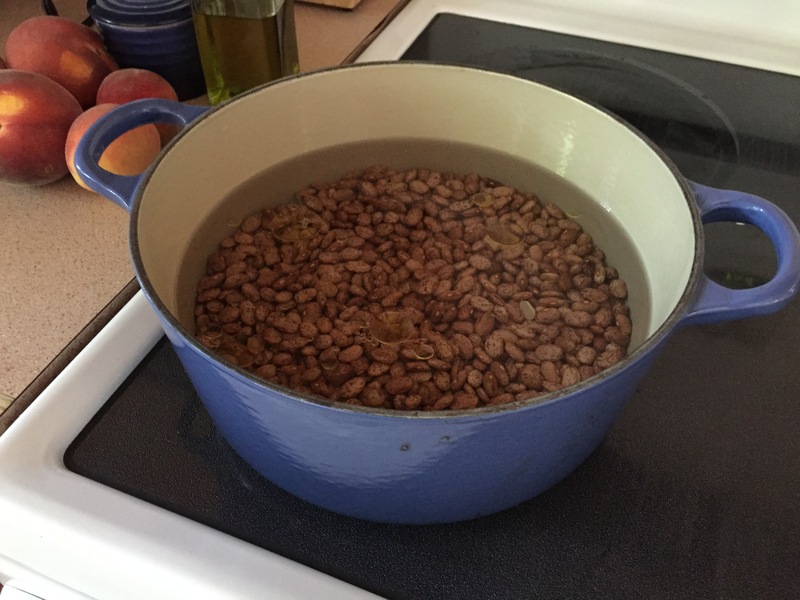 Place rinsed beans in a heavy pot and cover with 1 1/2 inches of water. Add salt and 1 splash of olive oil. Bring to a boil. 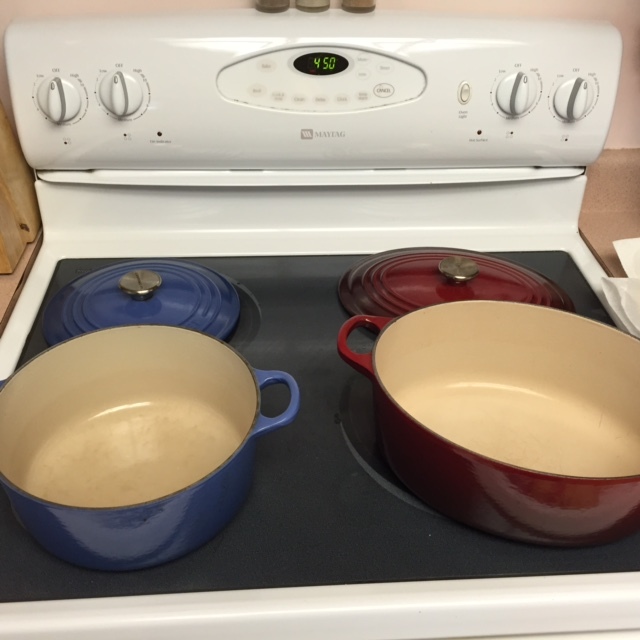 Remove from heat, Put lid on pot. Rest for 30 minutes. 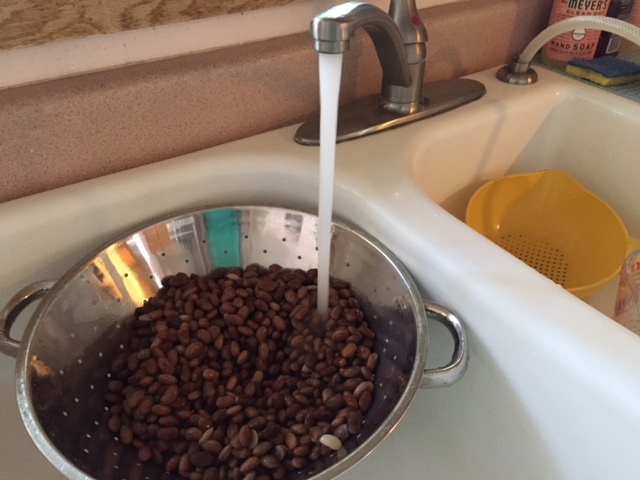 Remove lid and strain beans. 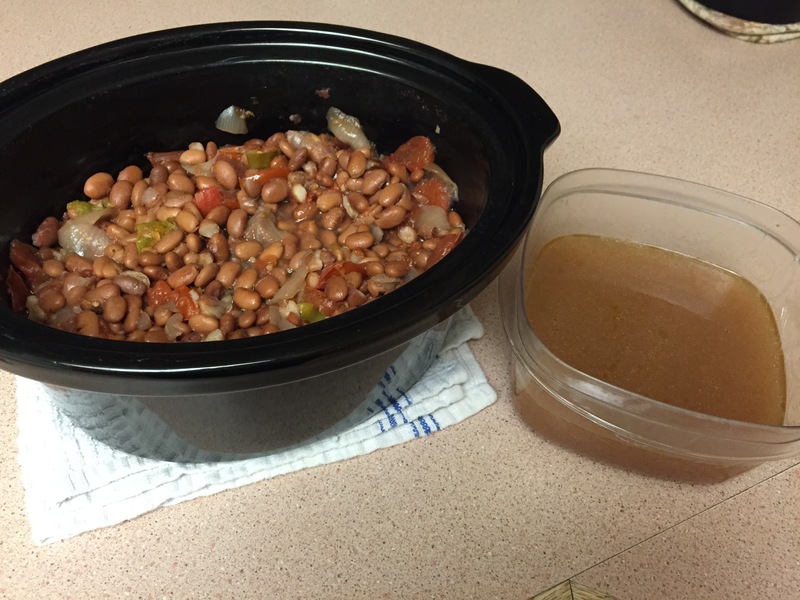 Rinse beans thoroughly (this is what removes the toot) Put beans in slow cooker, add vegetables coarsely chopped, 2 tsp salt and another splash of olive oil. 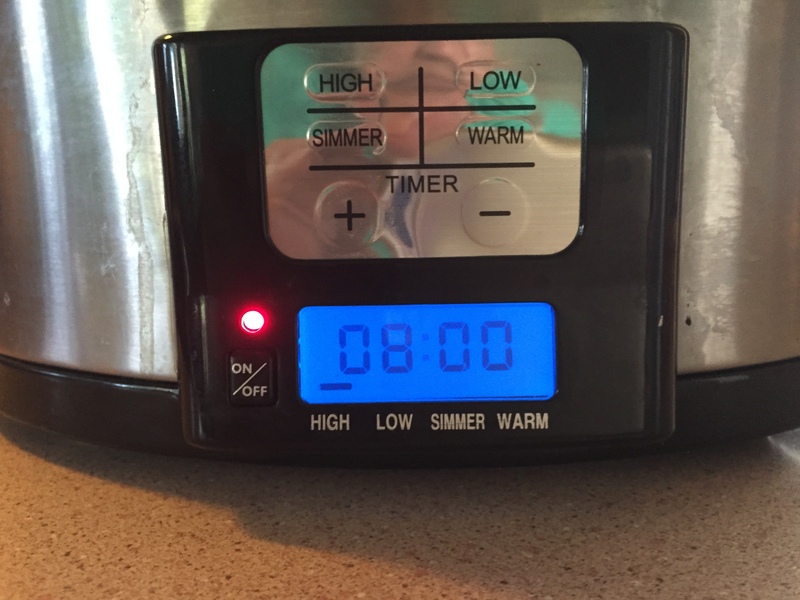 Cook on high and set timer for 8 hours. Be prepared for heavenly aromas. After 8 hours your beans should look like this To make sure your beans are done, take a couple out and smash them. 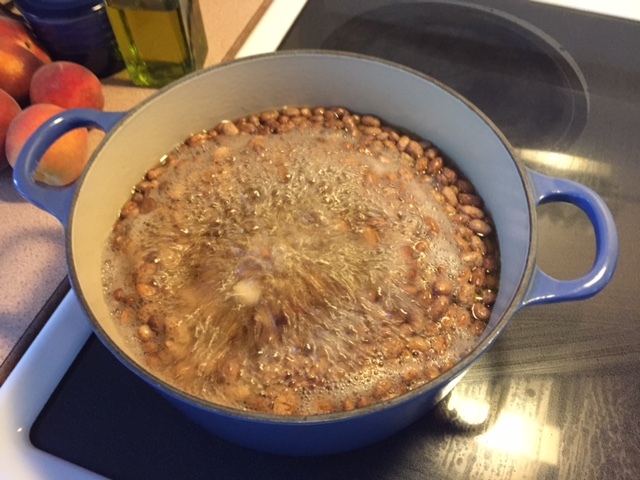 If they are sill hard return them to the cooker Ladle the excess liquid from the beans. Save the liquid. 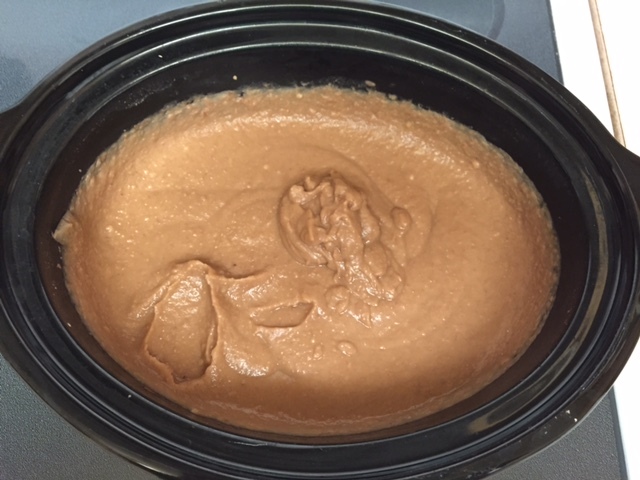 Using an immersion blender, puree the beans, adding liquid back as needed to form your desired consistency. 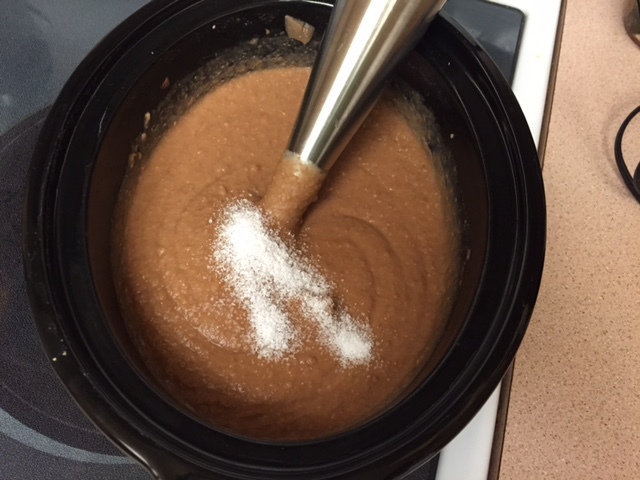 If you don’t have an immersion blender, you can use a blender or food processor. Salt to taste. Voila! Your beans are now ready to eat. Garnish them with salsa, cheese, chopped onions, chopped peppers, cilantro…the sky’s the limit. Or ladle them onto a tortilla, add some cheese and salsa and roll them up into a burrito. If you want to be adventurous try a little bowl of hot beans with cottage cheese in them. They look like vomit but taste delicious! It’s a perfect low fat high protein dinner. A fresh apple eaten along with the beans is a delicacy. I know it sounds crazy but it’s really good. 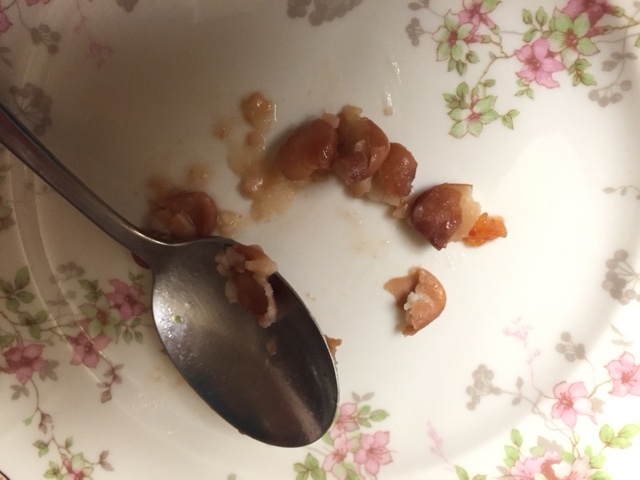 I hope you enjoy this simple staple recipe. 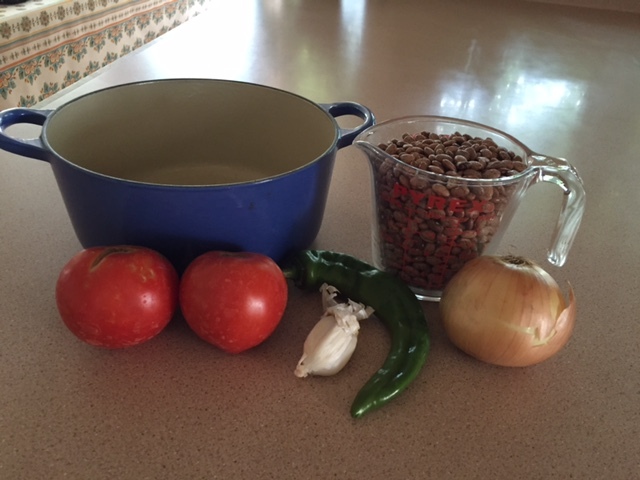 Stay tuned for my fresh salsa recipe in the near future. 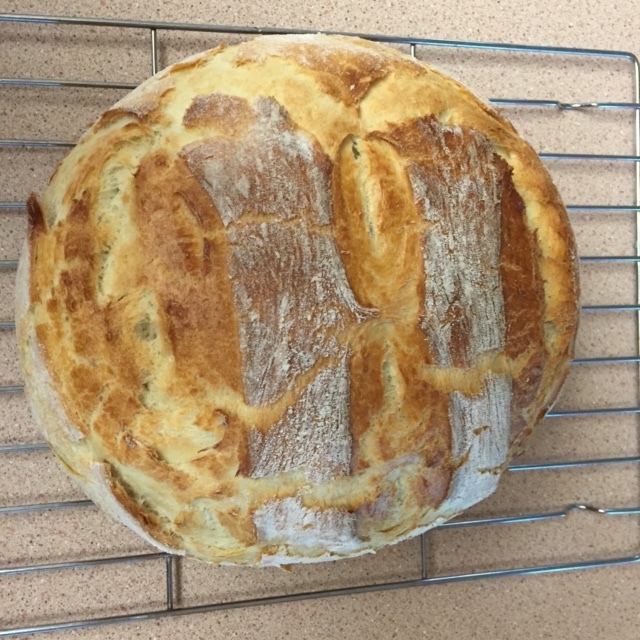 Many summers ago a dear friend taught me the art of baking Italian bread. Stir the little yeasties gently in one direction so as to not upset them. Give them a little sugar to help them grow… After several risings, and shaping into long beautiful loaves, the bread would finally be done. We’d carefully saw slices from the delicate warm loaves and eat them, sometimes with butter and some times with chunks of cheddar cheese. That summer we made omelettes using fresh vegetables from the garden, and though my memory is fuzzy, I think we ate off of hand made plates. Little did I know way back then, the seeds of the slow food movement were being planted in my soul. 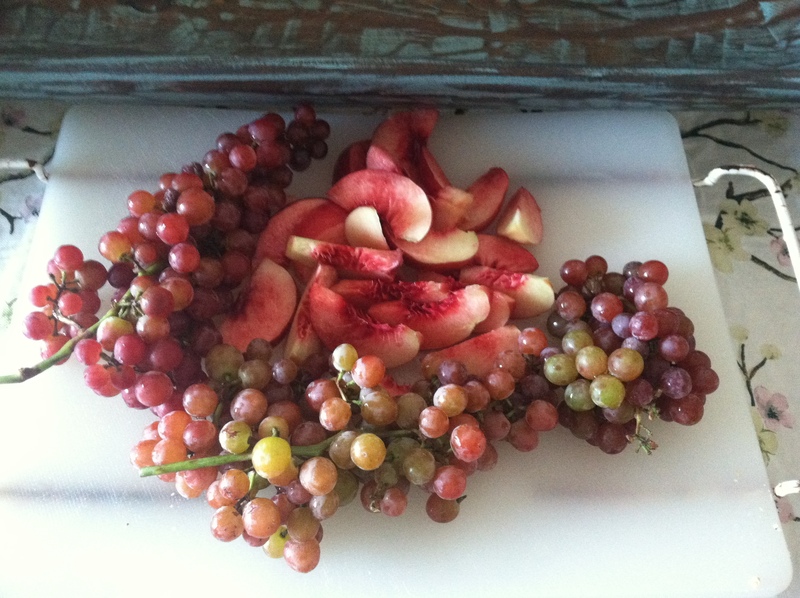 I think one of the most meditative things we can do is to slow down and prepare the food we put in our bodies. The miracle of life is in everything we eat: it nourishes us, comforts us, and sustains us. When we become mindless about essentials, we lose ourselves in the mad dash of a face paced existence. July 23, 2015 at 6:20 PM EDT PBS News Hour. I haven’t lost my love for baking bread and recently I have learned how to bake artisan loaves. My gift to you is this tutorial. 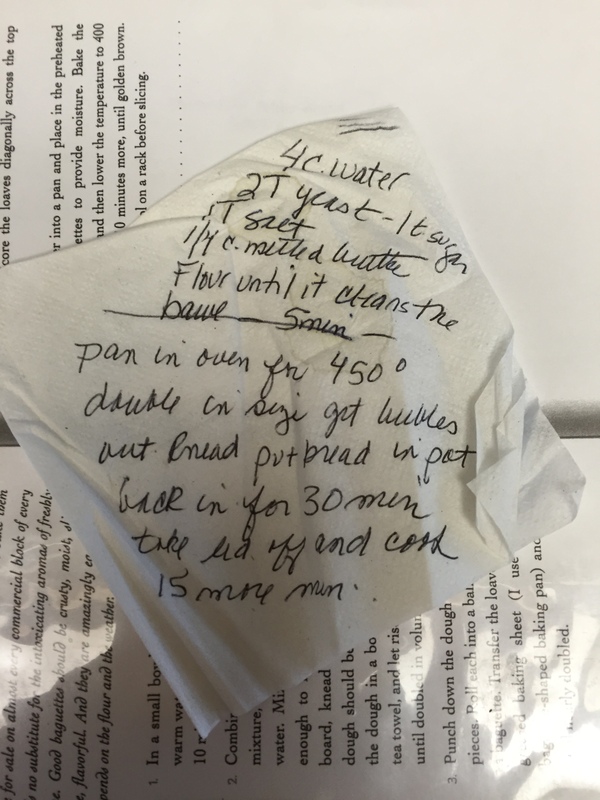 Slow down and bake a loaf for yourself. Start by putting your ungreased bakeware into a 450 degree oven. 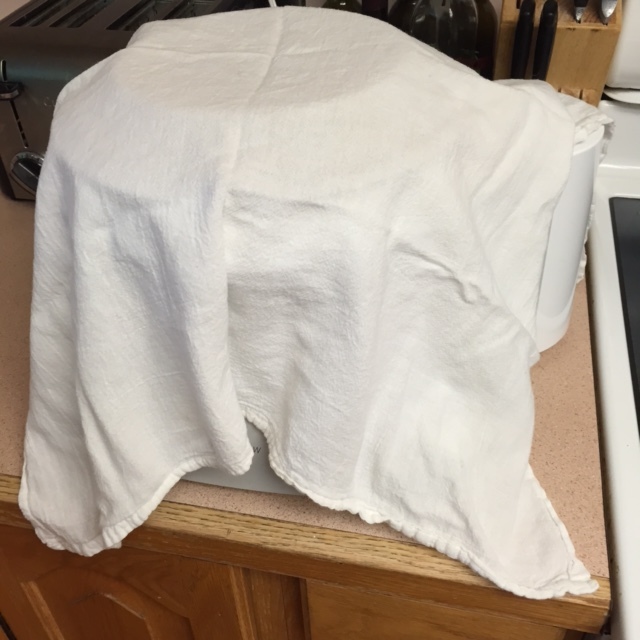 This preheats the bakeware which is the secret to baking crusty artisan bread. Leave the bakeware in the oven until you are ready to put the bread dough in it. 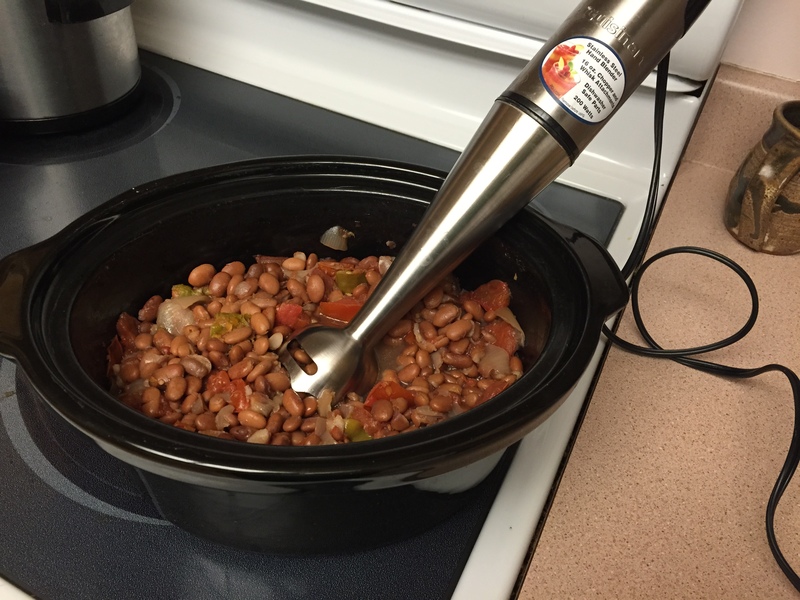 This recipe is made in a Bosch or Kitchen Aid mixer. You can make it by hand also. Pour 2 Cups warm water into mixing bowl. Add yeast, sugar, salt, and melted butter (optional). 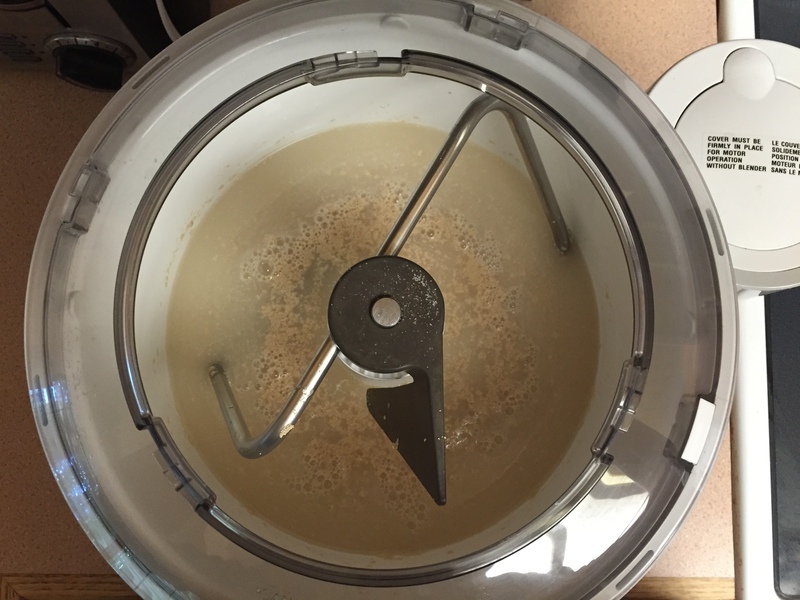 Turn mixer on and begin adding flour 1 cup at a time. You will know when you have added enough flour as soon as the dough cleans the side of the mixing bowl. 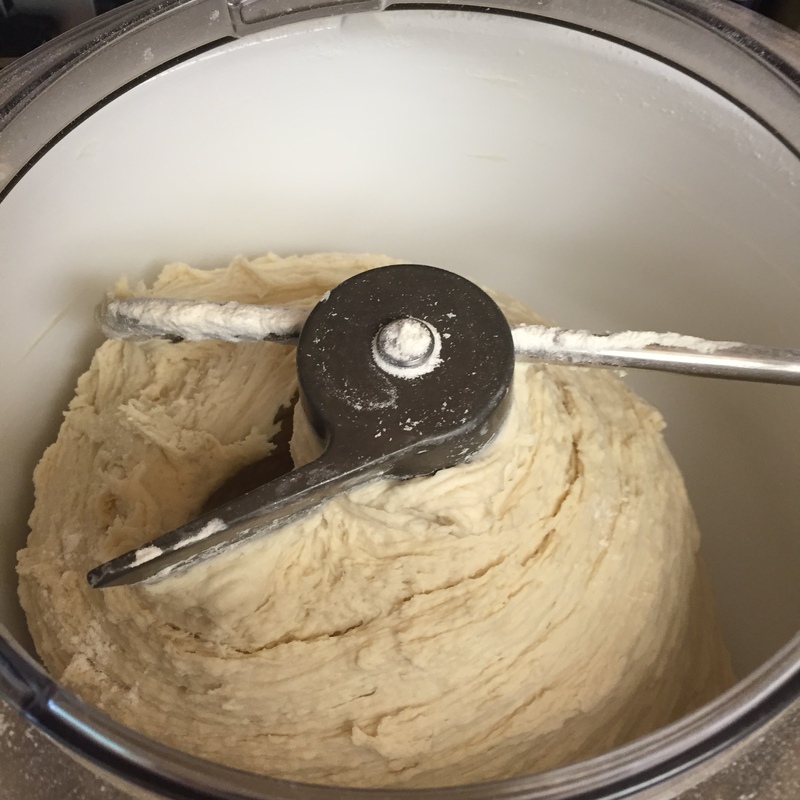 The second the dough cleans the side of the bowl, set the time for 5 minutes and let the mixer continue to knead. After 5 minutes turn the mixer off and put a clean towel over the bowl allowing the dough to rise for 20 minutes or until doubled. 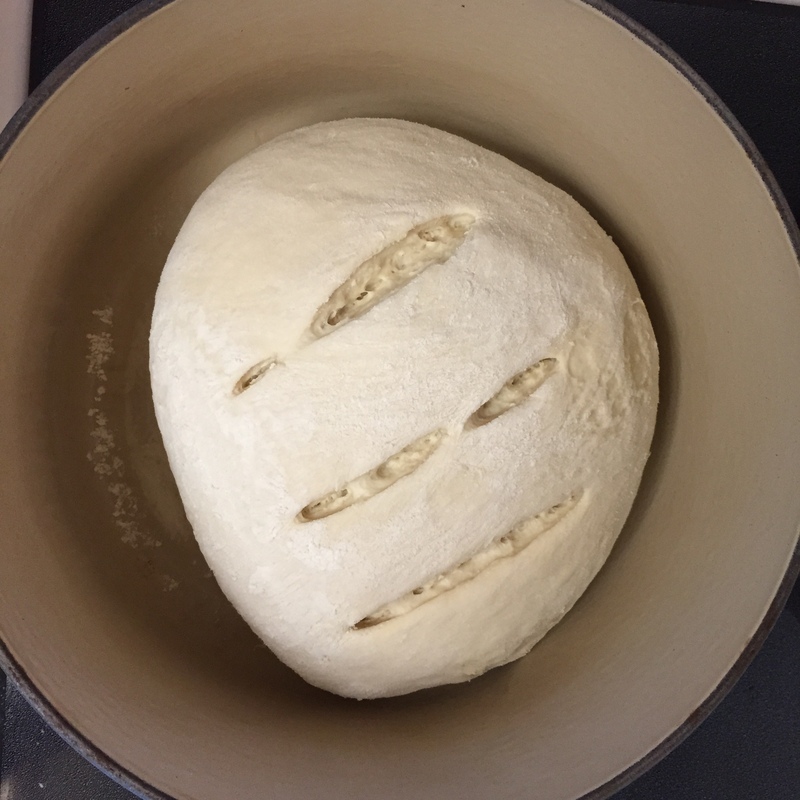 After the dough is doubled in size turn it out onto a floured counter or bread board and gently knead into a ball. Carefully take you hot bakeware out of the oven and remove the lid. Place the ball of dough into the bakeware. You can cut deep slits in the crust for extra beauty if you’d like. 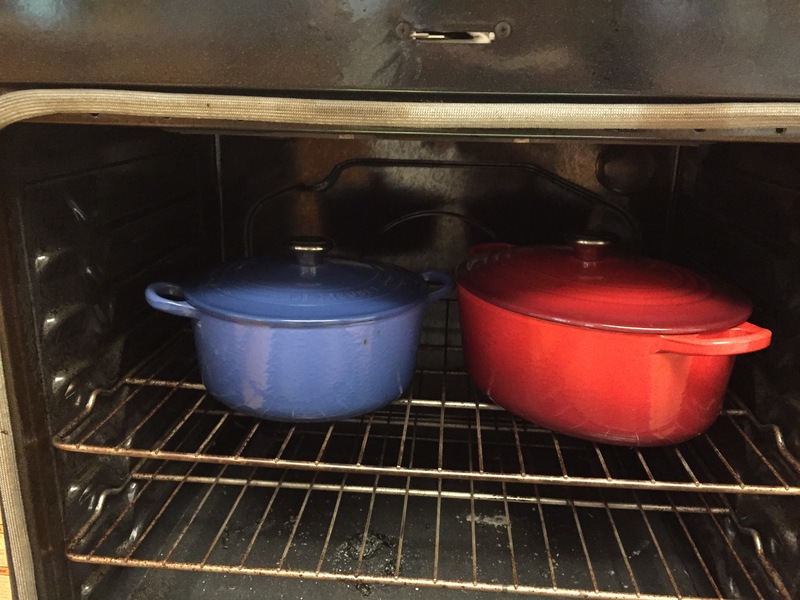 Put the lids on the bakeware and return to oven. Bake for 30 minutes. Take the bakeware out of the oven and remove lid. 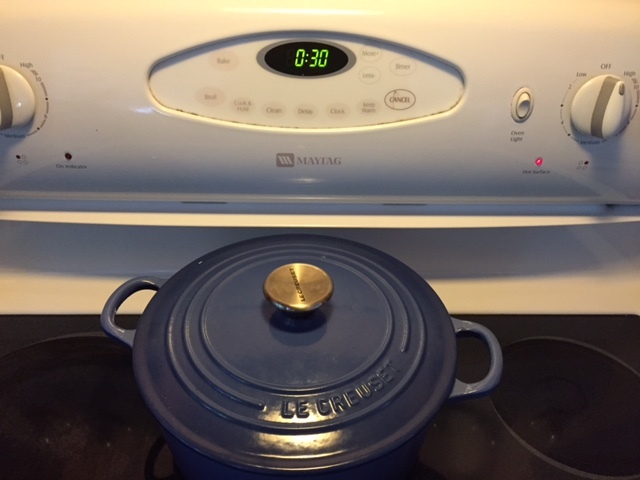 Return bakeware to oven for another 15 minutes. Remove bread from oven and bakeware. Cool on wire racks.